even though you can't input any information, personal or otherwise, anywhere on this site. 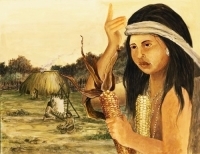 As people caught up in the busy hustle of the modern day technological world, we sometimes forget that there were Native American peoples here in the Americas before us. In my occupation, I try to understand how those first peoples lived and try to teach others what we know about them. By browsing my web site, I hope that you get some idea of what an artist involved with Archaeology and Anthropology might be called upon to do. Click on the image above to play the SunWatch game. Create illustrations for books, texts, newspapers, and site reports. I do many types of illustrations. For free, downloadable PDF files of teacher resources and projects Click here. To see models of various types of Native American homes click here. For an Ohio pre-history survey Click here. This is a "kid safe" web site. Susan K. Nelson has a Master of Arts degree in Archaeology Education from the McGregor School at Antioch University.